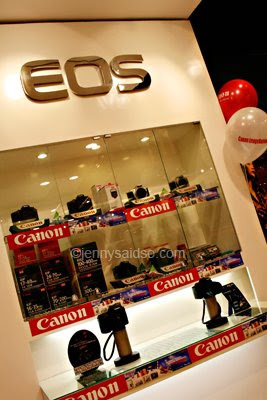 I took these pictures at CANON store at Megamall Branch about 2 months ago while I'm trying to canvas for the canon 50 1.8 mm lens and unfortunately it was not available. I asked permission to the staff that I will take some photos and they are more than glad to permit me. Canon as one of the leader in digital cams have been coming up with brand new models of DSLR, their new one is the Canon Rebel XS 1000d , you can see it on my previous post and they also have point and shoot cams if you don't want SLR cams. 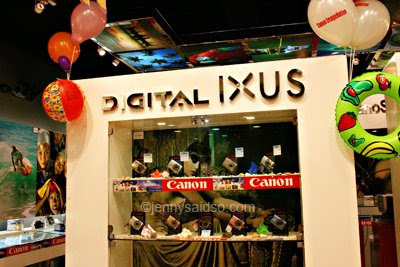 They have the IXUS models that many have been buying as Canon is equals to quality and durability. 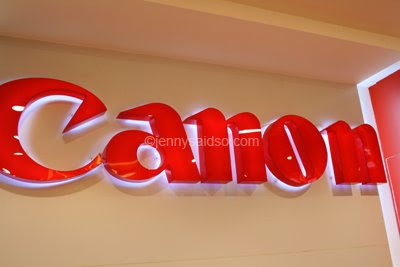 I am a proud owner of Canon rebel 400d with 50mm1.8 lens and i am wishing that I can buy soon the 28-135 mm IS zoom lens (keepin' my fingers crossed). What about you what Canon digicams do you own?? i use rebel xti (400D) too, i love it, but then, sometimes i prefer my hubby's canon 40D since i can spot that little difference in quality. but i love the 400D for the price. if you can check my blog, all the pictures there are from xti, and i am okay with it, we don't have to be using the most expensive one to take pictures, right? as long as we are happy with what we have. i have not checked the xsi yet. hi there, i'm more of a sony fan but sis has an ixus and it truly is sturdy and reliable! i would love any kind of canon.